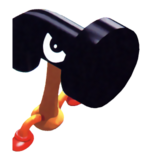 Mad Mallets are small hammer-like enemies and are the workers in the Smithy Gang. Found in Smithy's Factory during Super Mario RPG: Legend of the Seven Stars, they are a weaker version of Pounders and Poundettes. Mad Mallets are in charge of pounding Machine Mades into shape after Smithy is finished creating them. They also patrol the factory and sometimes are accompanied by Ninjas and Jabits. They also act as the bodyguards of the Clerk. Before the player faces the Clerk, he has his Mad Mallets face Mario, and two more Mad Mallets are present during Mario's battle with the Clerk.